The first thing to know about Santa Fe–based Robert Stivers’ The Art of Ruin is that, even for an art book, it’s oversized. At 16 by 20 inches, it’s disorienting enough to evoke a sense memory of childhood, of turning the pages of a picture book that exceeded the width of your lap. But the scale, subject matter, and production values distinctly announce that this is a black-and-white picture book for grown-ups. Each of the satin-finish pages is a photograph of a single subject, in close-up: a flattened party dress, vintage typewriter keys, lace fans, a clay-crusted hand. Things in this book are old, tattered, crumpled, worn—yet beautiful. As Steven Brown writes in the back-of-the-book essay, “ruin” does not just refer to loss; it’s also about recovery. Encountering the detritus of a culture allows us to learn much about its history, sociology, and values. But the poetic images here are in no way academic; they don’t tell you what to think about them. Rather, they invite you to free-associate about their meanings, and why the photographer chose each of them. Throughout the book and even on each page, focus comes and goes; the photographer’s generous, velvety use of blur feels opulent, far removed from the crisp, literal representation of commercial photography. 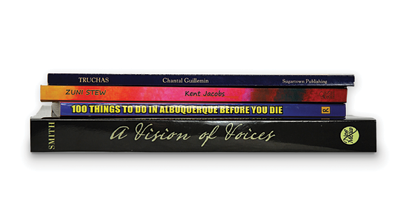 Stivers’ partnership with Twin Palms Publishers is a fine match, as the Santa Fe–based art-photography book publisher is well known for its luxurious production values, uncompromising design, and limited print runs. Some of the poems in Truchas: Close to Heaven sound like overheard confidences. That’s because Chantal Guillemin, whose family has been making annual visits to Truchas since the 1950s, interviewed the elders of Truchas when she was a teenager. These bits of captured oral history reveal details about everything from the evolution of the Truchas postal service (“at first it came on horseback / from Santa Cruz / to Ojo Sarco”) to the nuts and bolts of acequia maintenance (“to every four acres / you got to put one man to work”). These poems blend with Guillemin’s own memories of youth, well-observed lines about the local flora and fauna, and the push and pull between the old ways and modernization. A summery piñon pie gets a loving tribute. Guillemin’s plainspoken style is surprisingly hypnotic, deftly transmitting her intimacy with Truchas to the reader. When the main character, Dr. Jack D’Amico, leaves Chicago to serve as a doctor on Zuni Pueblo, he is unaware his family is about to get brutally murdered in a mob hit. The killers’ quest to take him out provides a strong thread of suspense; a whip-smart, bombshell FBI agent ticks the love-interest box. Zuni spirituality adds a well-integrated layer of mysticism to the book’s otherwise genre-faithful execution. Longtime New Mexico Magazine contributor Ashley Biggers is an authority on all things Albuquerque. She put her expertise to good use in this spirited guide-book, which recommends everything from the marquee attractions (a hot-air balloon ride during Balloon Fiesta) to the insider experiences (a gander at architect Bart Prince’s “Spaceship House,” as the locals call it). Suggested itineraries are also included. This book would be a great tool for anyone planning a trip or a move to the Duke City. Local opera authority Craig A. Smith, who wrote our 2012 retrospective feature “Arias Under the Stars,” about the vision of Santa Fe Opera founder John Crosby and the history of the opera house, brings us this first-ever biography of Crosby. Written with access to the SFO’s extensive files (including correspondence), Smith’s book provides a well-paced, intimate, insight-rich look at Crosby’s formative years, his 40-plus years as SFO’s general director, and his legacy. Sites like Chaco Canyon are stunning to visitors whether or not they are clued in to scholarly theories about the ancient Puebloan people and their unexplained disappearance. But it deepens the experience of a visit when they do. In engaging, layman-friendly prose, accomplished author David Roberts shares advanced intel gleaned during his quests to Southwest sites, including Chaco Canyon and Jemez Pueblo.